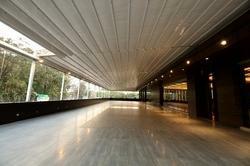 Skylights and Pergolas have become quite fashionable to have in one's home or outdoor patio in modern interior design. Skylights look good, allow a lot of natural light and provide a feeling of openness, but at the same time they allow a large amount of solar heat to come inside the room and a lot of light making the room underneath un-useable. 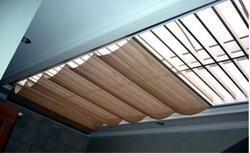 This is where an efficient Skylight Blind with the right fabric offers the best solution. 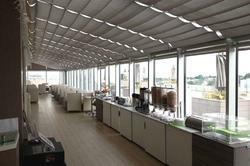 Skylight blinds with screen fabrics from Dickson Constant, France provide a blind that cuts solar heat by upto 96%, cuts the sun's glare and allows natural light to filter inside the room and at the same time allows visibility of the sky or the outdoors. A perfect solution to enjoy your very own sun-room. 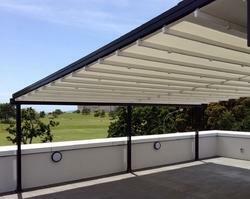 Retractable Roofing allows you to enjoy your terrace, backyard, balcony or conservatory all year round. 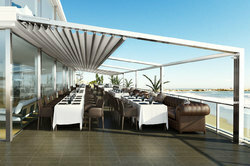 Enjoy the warm fresh air with your roof fully opened on hot days and relax into the evening for dinner under the stars. A key advantage of our systems is the amount of clear opening- when fully retracted at least 75%, of your space, will be uncovered. The system has been developed so you can be as comfortable as possible with in your space. Even when the worst weather is outside you are protected against it, and the natural light fills the space. 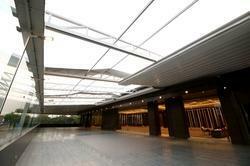 Looking for Retractable Roofs ?